In a game that was scoreless until late in the 3rd quarter, the final buzzer found the Eagles on the wrong end of the scoreboard as they fell to the hosting McMinn County Cherokees 7-15. The game was a hard fought matchup throughout, and it was a great effort by both teams. Above all, the defense shined as they held the home team to two touchdowns through all four quarters, with numerous young players getting their shot to prove themselves late in the game as the injury bug swarmed the visiting team. 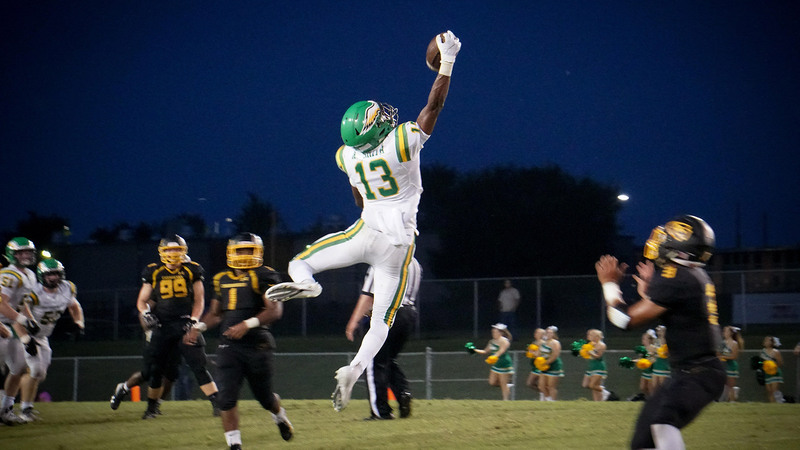 Offensively, the Eagles were able to score on an impressive 29 yard throw by senior quarterback Zack Pemberton to junior wide receiver Dillon Reed, as Pemberton broke a couple of would-be tackles and found Reed all alone in the end zone. However, it was a tough night for the triple option, as it managed 95 yards on 42 carries rushing. Pemberton attempted 7 passes, completing 3 for 49 yards and a touchdown. Pemberton led all rushers with 58 yards on 20 carries. Fumbles and penalties killed any offensive momentum the Eagles were able to generate. The team coughed up the pigskin 5 times, losing 1 of them and had 5 penalties for 50 yards. Injuries plagued the Eagles Friday night as two Eagles needed professional medical attention for injuries sustained in the game, while numerous others came out with cramps due to the hot and humid Athens weather and other nicks and bruises. The Eagles will be back in action next Friday night to face the Panthers of Lenoir City on the road with kickoff set for 7:30.